Do I have to sign a binding contract to sign up for Skyfi synKro service? No Skyfi synKro has no binding contracts and no hidden fees. We fully disclose what you are buying when you are buying it and how much it costs. Check out our Return Policy: 7-day refund guarantee of the service charge from the day of activation of your Unlimited Premium service! You pre-pay monthly for your service with a credit or debit card that is associated with your Skyfi synKro account. As a customer you can check your current account status by logging in to your account where you can see your services, your payment history and the next billing date. There are no limits! Skyfi synKro offers Unlimited Premium Internet service - one flat monthly fee for all the broadband Internet you can use! Also, check out our Accelerated Performance Services™! Speed (bandwidth) is just one factor in your broadband Internet experience. If you are like most people, you might be doing many things at the same time: checking email, browsing the web, playing a game, streaming a song or video, etc. APS allow you to take better control of how Skyfi synKro 4G network handles your data. By signing up for an APS, you are asking synKro's dynamic network intelligence to optimize your video, game, voice or download so that it goes as smooth as possible maximizing your satisfaction as a user. Your connection is very secure. We use 4G state-of-the-art security protocols that protect your communication with the Internet. These are activated automatically and are operating at all times. No one else can "listen in" to your Internet connection. On the homepage, click the "Buy Now" button and enter your address. Our system will determine if you are in coverage. You will get a message if you are not, and if you are you will proceed to pick out services. You can also call us at 812-735-2116 and we will check for you. Yes you can. The outdoor modem device from Skyfi can be connected to an indoor router. The internet modem is outdoor only and is connected to a device inside of your home by our installation professional. A separate wireless router purchase will be necessary to extend that service throughout the house. All Premium Fixed services include professional installation to a device inside your home. Additional services are available from Skyfi that will allow you to have wireless coverage throughout your home or office. How do I get my Skyfi device? Yes you can! We offer a vacation package that keeps your account active for a low nominal charge for as long as you are gone. Just call us at 812-735-2116 to arrange a vacation package. There is no other service charge or hidden fees and you can apply any existing prepaid active service to the vacation service charge. During this time, your modem should be turned off. You will be unable to use the Internet until you call us and reactivate your service. Make sure that you have active service. It may be as simple as updating your payment on file. If you have access to another Internet connection, log in to your account on www.Getskyfi.us and make a payment or call us at 812-735-2116 and we will help you solve the problem. 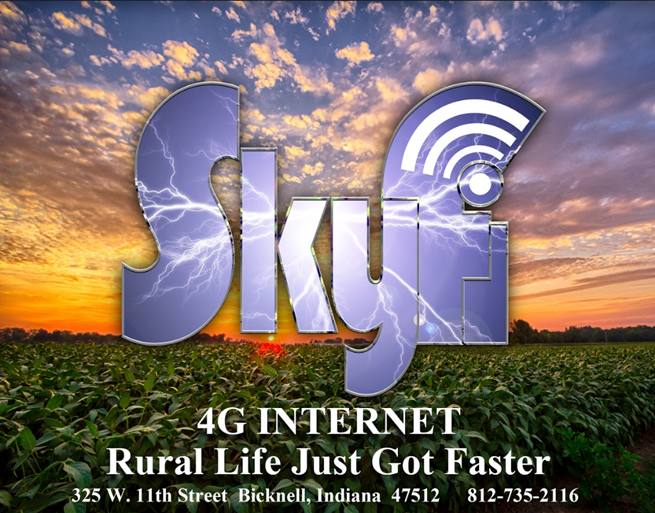 If you have access to a different Internet connection, make sure you are in coverage area by entering your current service address at on www.Getskyfi.us or call us at 812-735-2116 and we will check for you. Often, the problem is minor, maybe your credit card on file has expired. Either login to your account or update payment information on file, or just call us at 812-735-2116 and we can get your service going again in no time! Just call us at 812-735-2116 and we will cancel your service. If you are a Unlimited Premium Fixed subscriber, we will make arrangements to come and uninstall the outdoor modem. Phone 812-735-2116 : Business Hours 9:00 AM to 5:00 PM Mon-Friday. Saturday open until Noon. Phone messages are monitored 24 hours.